Our ‘Chat about Chance’ celebration delights the audience. Well, what an afternoon! On Saturday the 15th April 2017 Chance enthusiasts converged at the Brasshouse Community Centre in Smethwick to enjoy tea, cake and indulge in a good old natter. Community heritage worker Nita Newman introduced our panel of former Chance Glassworks employees and we got more than we bargained for. Again, the sense of family and place became fully apparent. However, beneath the congeniality belies a professional rigour that we can all learn from today. Chances devotion to the professional development of its workforce was second to none; it appears that they left no stone unturned and no question unanswered in striving to reach perfection. Special thanks to ex Chance employees, Nanette Headley, Arthur East, Ron Southam, Gerry Lane, John Walker and Alan Hazeldine for making this event a day to remember. Here are some of the stories…and an image gallery below…more to follow. Visit our brand new legacy website here. Ron Southam recounts mouth pipetting lethal CYANIDE! We couldn’t believe our ears. Chemistry lab training so was rigorous in regards to training safely with pipetting water meant that they were able to mouth pipette cyanide safely. One false move and a chemist would die within seconds…but not if you were trained by Chance. Ron was adamant that it was due to the excellent training that safety was never an issue. I could have started my own glassworks! John Walker, was so succinct in recounting how his practical training gave him the confidence to do anything he wanted. He went so far as to say that it was so good he could have started up a glassworks himself! John Walker warmly recounts how training made him fearless in the workplace. It ay the size of yer funnel, it’s wat yo dew wi it! Alan Hazeldine recounted the time when Chance had to make a funnel, the funnel had to be perfect and work on the rest of the project could not continue until it was perfected…it turned out that the funnel would have worked in whatever size it was manufactured at. Chance was so dedicated to the precision of the product that this little problem needlessly stopped production for longer than necessary. Alan also filled us in about the journey of Chance after the site on Spon Lane closed in 1981 and his subsequent journey to Malvern. Alan Hazeldine fills in some of the gaps about the closure of the Smethwick branch of Chance Glassworks in 1981. Chance Glassworks is still in operation in Malvern today. The replica Golden Hind that was made for a carnival float was also remembered. See the film about it here. This is a NEW appeal. Deadline 3rd March! The future of Chance is yet again in the balance. Please save the Chance Glassworks from another 2 years of uncertainty! A suggestion by a participant who has already sent his objections is for us to supply a template. Please see a suggested wording below at the bottom of this post: I would strongly urge you to put your own personal point of view forward. We do not want to appear like sheep without minds of our own, we all have individual and collective reasons to save the buildings. The skip hire operation had appealed against an Enforcement Order issued by Sandwell Council because it is operating without planning consent. Skip hire can’t overturn the decision, but they are requesting a delay of the Enforcement Order for another 2 years! 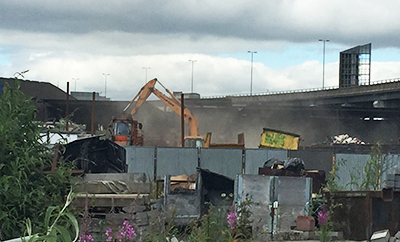 We must emphasise that it is not our wish to see No1 Skip Hire go out of business, however they have already been operating without planning consent for nearly a year and we feel that ample time has already elapsed for them to find an alternative site. Please help us save the Glassworks by emailing or writing to the Planning Inspectorate, Bristol, quoting Appeal Reference: APP/G4620/C/16/3161898. Visit to the Appeals Casework Portal and enter the case number; 3161898 and follow the instructions. The proposal is contrary to the National Planning Policy Framework, and local polices, ENV2: Historic Character and Local Distinctiveness, SAD HE 1 Listed Buildings, SAD HE 2 Conservation Areas, SAD HE 5 Archaeology and Development Proposals in that the proposal causes harm to the setting of a number of listed structures and the conservation area and it is an inappropriate use for a Scheduled Ancient Monument, causing substantial harm to the heritage assets. The proposed use has been demonstrated to be non-compliant with policies ENV2 and ENV4 of the Black Country Core Strategy and with SAD policies EMP3, and EMP4 and HE1, HE2 and HE5 having failed to demonstrate the compatibility of the use with the heritage status of the site, the amenity of neighbouring land users and the canal side environment. I am lodging an objection to No1 Skip Hire from renewing their temporary planning consent in the strongest way. I am ………….state who you are as part of the community and your interest in the site. The Chance Brothers site is of enormous importance to Smethwick and the wider world, there are Lighthouse enthusiasts around the world who know the significance of Chances contribution to maritime safety; and here on land, the contribution to community cohesion is more important than ever. Looking back and valuing our heritage secures our future. The history of glass making is of vital national importance and we should be celebrating this and ensuring that this nationally important Scheduled Monument is saved for the nation and is sustainable by creating a mixed use facility that will allow its uses and visitors a place to live, work, play and shop. Smethwick needs this! The skip hire is a nail in the coffin for the regeneration of this glorious site. It cannot be lost because of time wasting. We/I am/are sure that the local authority would have been supportive in helping to find alternative spaces. In light of the fact that that planning had previously been granted I/we can understand why it would have looked like a given that planning would again have been granted, however, the groundswell of opinion has obviously changed and I/we would urge the planning depatment to consider the space in the light of the potential that a redevelopment of the space has to offer.The skip hire company have a duty of care to their workers and it may have been wise to re apply for planing with more urgency, and before planning expired. The No 1 Skip Hire company could have made a pre-emptive effort to safeguard the future for their workers and looked for alternative strategies if they were refused planning permission. Again you may have your own take- a suggestion from a participant was to point out the sites that they could occupy as an alternative…you may have other suggestions up your sleeve. Sign off with your name as usual. Thank you to Chris Rogers for suggesting this template. I have used a mix of my own words, the council guidance and Sally Montgomery’s letter. Hope this helps. Please note that comments sent to the planning department outside this ‘suggested’ letter cannot be controlled ouside of this template. A talk about lighthouse illuminates us all. Expert speaker Mark Lewis, entertained and enthralled his audience with his knowledge of lighthouses dating right back to ‘Pharos’; one of the seven wonders of the world. We learnt about the use of volcanoes as a navigational aid right up to GPS navigational systems and everything in between. MADE were delighted to see some new faces amongst more familiar attendees who already know about our project ‘Everybody’s Story’. On Saturday 22nd October we hosted two talks about the history of the lighthouse. The first talk was fully subscribed and was held at Smethwick Library (Sandwell Libraries) and the second more discursive talk was held in the afternoon at the Durga Bhawan Hindu temple on Spon Lane. We learnt about why we needed lighthouses and why three lighthouse keepers were needed rather than two. Mark revealed the challenging life of the lighthouse keeper, a dark tale of two unfortunate keepers and how and why each lighthouse had to differ. We were treated to viewing a stunning array of the different types of lighthouse world wide and who and what organisations were involved in their upkeep. Mark Lewis is a member of the Association of Lighthouse Keepers (ALK) and was a founder member of the World Lighthouse Society. Dark tales: Mark entertained us with a dark tale of an argument between two light housemen posted out at sea. An argument was followed by a fall and subsequent death of one of the keepers. The lone lighthouse keeper decided not to bury his poor colleague at sea, so he built a wooden coffin from the wood kept on the light. He propped up the coffin at the top of the lighthouse. Many weeks later the relief boat crew could see they were being greeted by a man waving frantically at them. When they arrived they found the surviving keeper huddled in a deranged state of shock; the waving man had broken out of his coffin in a storm and was flailing around at the top of the light. From thereon in three keepers were assigned to the light. The life of the lighthouse keeper: Lighthouse keepers had to take food and water for a duration of 6- 8 weeks. No drinking water was available and it was compulsory that the keepers knew how to look after themselves. The job demanded that they wear a military style uniform and they must be responsible to keep the light running at all times. Being able to cook nutritional meals was extremely important to ensure the health and fitness of the crew was maintained; it would be a long time between being relieved by fresh crew and supplies. Too many lighthouses! As lighthouses became more and more prominent on the coast line another difficulty became unsettlingly clear to mariners. In the 18th Century it was hard to tell which light was which and accidents happened. Captains became confused about which stretch of water they were sailing in. Lighthouses were configured to have their own unique flashing pattern which distinguished them from each other. Different lights: Lighthouse lenses differed greatly in size from the massive Hyperadial light to the large ‘1st Order’ light right down to the diminutive ‘6th order’ light which was designed for buoys and beacons. The reliance on GPS: All UK lighthouses in the UK are now automated and no longer need a keeper; they are remotely controlled by Trinity House. They do however have an attendant to do regular maintenance. Concern amongst the audience became apparent when it was revealed that the UK does not have its own GPS system. GPS is maintained by the USA. The dreaded ‘GPS signal is lost’ warning can also happen at sea putting the lives of sailors and fishermen at risk, this will become even more apparent when more lighthouses become decommissioned and seemingly redundant. Food for thought. Finally: A gasp of approval: It was revealed that the Chance Glass Works Heritage Trust heded by Mark Davies is planning to build a lighthouse in Smethwick on the Spon Lane site. The Lighthouse would tower over the motorway and would be seen for miles. Audible gasps of approval came from the audience at the thought of this wonderful venture! Find out more about the trust and their ambitious plans for the site here. Special thanks: Special thanks to Ian Gray at Sandwell Archives and Sunjai from the Durga Bhawan for providing splendid service and a warm welcome for our guests and the team at MADE. We would also like to thank the team at the ALK for their promotion, professionalism and support of ‘Everybody’s Story’. Many other groups and societies have also helped us to promote our project, some of which are mentioned in the previous newsletter below; click on the links to find out more about them. Nita Newman and Mark Davies headed a talk about what MADE and the Chance Glass Heritage Trust are doing to keep the legacy of Chance Glass Works alive. We spoke about our work with Holly Lodge School, Sandwell Library Archive in Smethwick, our wonderful oral history participants, our volunteers, the successfully blocked skip hire planning application, the lighthouse links programme, exhibitions we have held, ‘The M5 Mile‘ and much more. Mark also informed us about the future plans for the derelict site which you can see here. We also informed everyone about future events involving lighthouse talks and family art workshops. We made lots of new friends and reacquainted ourselves with friends of the Everybody’s Story project. We were joined by the Birmingham Canal Navigation Society, photographers, artists, the ALK (association of Lighthouse Keepers), Bournville College and the Smethwick History Society amongst others and the Black Country Society amongst other interested parties. Thanks to Friends of Galton Valley Canal Museum; Sandwell Council and The Brasshouse Community Center (North Smethwick Development Trust) for mutually supporting us with this important work. After our talk we went for a walk to the Smethwick Pumping Station and took a walk along the canal to the Chance Glass Works Buildings and back. Mark Davies found extruded tree roots that were taking a determined hold in the brickwork; there’s a fascinating image in the gallery below. Want to keep an eye on what we are doing at MADE? Sign up to the news letter here, and of course- follow this blogsite! Photography by Nita Newman and Pooja Raj. Thanks to the efforts of individuals from around the world a planning application for skip hire and rubbish sorting activities has been blocked. Chance Brothers Glass Works has been successfully saved from 11 years of potential damage that could have had a massive impact both physically and economically. On Wednesday 13th July planning was blocked by a 6:1 majority; Sandwell Council received 600 objections and 28 letters of objection from as far away as Australia. MADE and CGWHT held extensive Twitter campaigns, an on line petition, facebook shares and email call outs to raise awareness. Contributions also came from year 7 pupils from Holly Lodge School alongside the staff at MADE and Chance Glass Works Heritage Trust (www.cgwht.org). The young peoples contributions to the press release in the Express & Star has helped in saving Chance Glass Works from further damage from current and future activities on the site. Pupils at Holly Lodge have demonstrated how they value their locality and its heritage through learning about and choosing to support Chance Brothers. The banners that the young people are pictured with were later altered for a celebratory art installation as a small part of the ‘M5 mile’ event held on Saturday the 16th July 2016. Holly Lodge Yr7’s young people with banners. Maybe one day we will see a lighthouse in Smethwick, thanks to everyone’s help. Eleven yellow Ribbons (by Nita Newman from MADE) were tied around a motorway pillar opposite Chance Brothers Glass Works as a symbol of Solidarity as part of the MADE ‘M5 Mile’ installation by local artists. Details of the ‘M5 Mile’ installation by 6 commissioned artists can be found here. We made badges on site with the official Chance Glass Works Heritage Trust lighthouse logo. We think this logo could hold much potential for the branding of Chance Glass Works Heritage Trust. The designer of this logo has done a fabulous job! Deadline extended until 12th July. The future of Chance Glass is under threat. A planning application is open for a skip hire business to operate on the premises for a duration of 11 years. The noise, vibration and lorries that thunder by this fragile grade two listed building can no longer continue. This video here shows the scale of the noise. Click here to see Chance Glass Works Heritage Trusts aims and objectives. We would like to thank the people who have already made personal objections from far and wide; but we need to keep up the momentum – so pass this message on. Please send an email to the planning officer william_stevens@sandwell.gov.uk to express your concerns about having a skip hire on what could be a world class heritage site. ALTERNATIVELY : Sign up to the Sandwell Council website, it only takes two ticks! The deadline is 12th July 2016 . Use the comments tab to make your case. Proposal: Retention of use for a further 11 years for use as a household skip hire and sorting business, associated portable buildings, sorting shelter, perimeter fencing and skip lorry parking spaces. MADE is running a HLF funded project to explore the heritage of the glassworks, you can find out more about this here.